If you’re hiring a boat on the Norfolk Broads, one of the first questions you might ask is where to eat if you’re not wanting to cook on board every day. 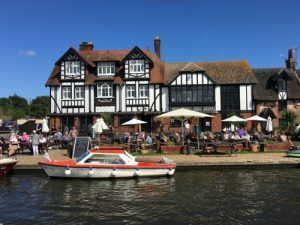 The Broads offer a vast array of delicious places to eat and drink but you won’t find numerous restaurant chains whose menu’s you might be more familiar with if you are looking for vegetarian and vegan dishes. With our local knowledge, we’ve saved you some leg work and selected some of the best vegan and vegetarian friendly places to eat in the Norfolk Broads. Top marks to this place. Its menu makes it easy to choose with dishes clearly marked with, vegetarian, vegan, gluten free and even dishes can be altered to become an option for vegan or vegetarian requirements. Their Spring menu offers dishes such as delicious soups, beetroot risotto and garlic ciabatta, all of which are suitable for vegan diners. To top it off, it’s also dog friendly in the bar area where meals can be served instead of the restaurant area if you are bringing your dog with you on your boating holiday. 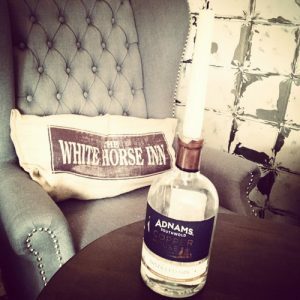 They distil their own gin and brew beer on site, you can even see the brewery through a glass panel in the restaurant. You can buy their core range, although occasionally they’ll create a seasonal brew to try a little something different! There are 12 free public moorings available at Neatishead. Moor up and you’ll find The White Horse less than a 10-minute walk. This has to go top of the list. It’s a dedicated vegan and vegetarian restaurant that concentrates on widening the appeal of freshly cooked in-house vegan, vegetarian and free from dishes. Their signature dish is a delicious mushroom wellington. You’ll find this gem if you moor up at Whitlingham Great Broad (there 20 spaces of free Broads Authority moorings) and a take a 20-minute stroll towards Trowse where you’ll find River Green Cafe. 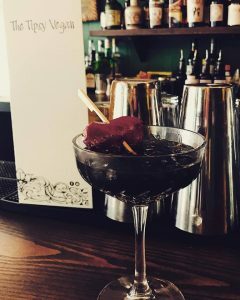 You’ll find this wonderful vegan cocktail bar and restaurant down the historic lanes in Norwich. They pride themselves on being the only vegan restaurant in Norfolk who serve up the dishes many vegans would like to see more of! They say you’ll never see a mushroom risotto or a ratatouille on the menu – only the most comforting classics that taste exceptionally different! You’ll head right into the heart of city centre and towards the last point hire craft can reach at Norwich Yacht Station where there are approximately 50 mooring spaces (don’t worry, there’s plenty of space to turn around!). Take wander past Pulls Ferry, a flint, 15th-century watergate, the route for the stone used to build Norwich Cathedral which can be found a short distance ahead. Head through Tombland, the true heart of Norwich which is steeped in history. Pick up St. Andrews Street and it will lead you on to St. Benedicts and The Tipsy Vegan can be found on the left hand side. It will take between 15 to 20 mins to walk, longer if you take in all there is to see along this historic route! Overlooking the River Bure, dining inside or out, it boasts one of the best pub food menu’s in Horning. The Swan Inn even have a menu especially for vegans. Dishes include spiced chickpea, aubergine and spinach burger, coconut vegetable curry, sides of miso sesame glazed aubergine and delicious pudding such as rich chocolate tart. In fact, they cater for all tastes from children’s menus to night specials such as Pie Wednesday, even then they offer a roasted vegetable tart on Pie Wednesday suitable for vegans. There are a handful of free Broads Authority moorings and The Swan Inn also offer a couple directly outside. It gets busy during the summer months and you may wish to moor a little further away at Ferry Marina, Freedom Cruisers and Norfolk Broads Yachting Co where where free mooring is available for Herbert Woods customers, on a first come first served basis. An idyllic Norfolk Broads country pub in the beautiful village of Woodbastwick, next to Woodforde’s Brewery, you’ll find pub food at its best here.Their carefully selected menu is built around wholesome, local produce. The Fur and Feather is Woodforde’s very own brewery tap, where in their words, the beer travels meters, not miles.They serve a clearly labelled menu of vegetarian and vegan foods.It’s just a 20-minute walk from Salhouse Broad moorings. Take in the stunning sea views from the fully glazed terrace which has an electrically operated retractable roof and side panels for those sunny warm days with excellent outdoor heating and cosy blankets for your knees if the weather turns chilly. They offer a menu specifically for vegetarians featuring vegan friendly dishes too. Dishes range from whipped goats cheese for starters and a red Thai vegetable curry and a vegan bean stew and a vegan apple crumble dessert. Their very accommodating chefs are also able to happy to offer alternatives if required. Moor up at Great Yarmouth Yacht station for a small fee, here you’ll find the largest free Broads Authority moorings in the Norfolk Broads. 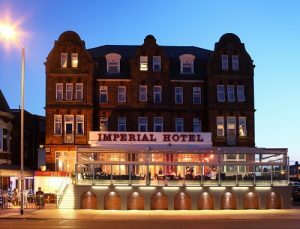 Head more or less in a straight line towards the sea and in less than 15 minutes you’ll find yourself at the quieter and more relaxed northern end of the seafront with views overlooking the beach and sea and you’ll find the Imperial Hotel.